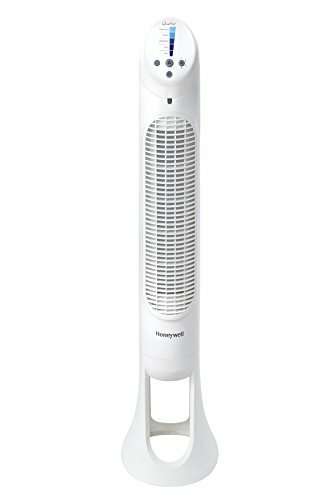 Honeywell Quiet Set whole room Tower fan with 5 speed powerful, quiet whole room cooling. Auto-dim lights reduce to 50Percent brightness after 15 seconds. Touch button electronic Quiet Set controls. Refer to the user manual for troubleshooting steps. OSCILLATING REMOTE CONTROL TOWER FAN: The Honeywell QuietSet tower fan provides powerful whole room cooling with quiet operation, oscillation & automatic shut-off timer. 5 levels of sound & power settings let you choose what's best for your environment. QUIET COOLING: Honeywell's QuietSet line of fans are quiet & powerful, so you'll feel the fan's cooling power with less sound. HONEYWELL QUALITY: Help improve air circulation & energy savings in your home, bedroom or office with Honeywell fans. Compare to tower fans, oscillating fans, desk fans & similar fans Dyson, Lasko, Blizzard, Turbo, Holmes, Vornado, and Pelonis.